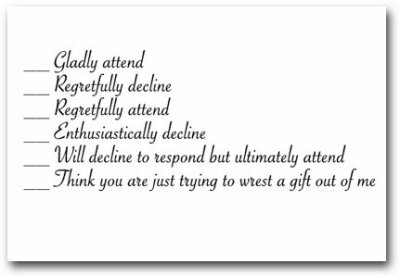 I'm sure that none of you reading this need this reminder, but when you're invited to a function and an RSVP is asked for, do it. I know it's easy to set things aside and forget. Things get lost. We think we'll do it later. I do it all the time. I just did the budget review of our daughter's wedding. Not having an accurate count, even a week before the wedding, cost us right at $900. I am not complaining. The party was worth every penny, and then some. But I think we tend to forget that there's a good reason hosts need to know if we are coming. RSVP. It's just good manners.And you never know when you might be the host. I'm a pretty decent cook. I enjoy cooking and I like to try new things. I keep a well-stocked pantry and have gotten pretty good at just pulling things together into a meal, based on my mood and what sounds good. My daughter is a newlywed who found herself in the position of needing to fix dinner a few nights ago without planning and using only the ingredients on hand. She didn't think she should need a recipe. She should just be able to pull it out of her head. She couldn't. So she had, in her own words, a minor meltdown. She has an unrealistic view of how most people cook. Her husband is an excellent, intuitive cook. As a result, to comfort her, I find it necessary to blog about what dinners were like in the early years of our marriage. I was not a complete novice. I cooked dinner many weeknights my last couple of years in high school, but my mom did the planning. I only had to cook. And she had taught me many of the basics. When I got married I cooked the same things that I had eaten as a kid. I had a rotation of about seven meals. I think all but one involved a white sauce or Campbell's soup. We had tuna noodle casserole nearly weekly. Creamed tuna or creamed dried beef on toast was a frequent meal. Some version of hambuger browned and cooked with soup and noodles--and maybe cheese--was a frequent dish. Salmon cakes and spinach. Hamburger gravy. Spaghetti made with Ragu. That was pretty much it. Add a canned or frozen veggie and some canned fruit. I had recipes that I made sometimes. My grandma's beef stew. A couple of chicken casseroles. Once in a while I might make a roast with potatoes and carrots for a Sunday dinner. But I never veered far from the foods that I grew up with. And my husband started our marriage as a 19-year-old college student. He would eat anything. I'm not sure when I started to cook differently. I remember a chicken enchilada casserole that a friend made when Patrick was small that may have been a starting point. Being a Weight Watchers member and then leader changed my cooking somewhat, but made me more recipe dependent when I strayed from the baked chicken breast or piece of fish and broccoli. I like having a lot of ingredients available and having many choices. I have a generous grocery budget. I'm kind of spoiled. But it has taken me years and lots of experience to be able to cook this way. And sometimes it fails me. I stand and stare at my pantry and the ingredients don't seem to amount to anything. Those are the nights that my family usually gets spaghetti, tacos, or chicken breasts. My advice to the person who is newly responsible for cooking meals for a household is to have a couple of meals that you always have ingredients for and that you can cook easily, whether with or without a recipe. These should be things that will almost always sound good to the members of the household. (Around here spaghetti is the big fall back, although in recent years lentils have moved up the list.) It will save lots of stress, and avert meltdowns. Making risotto. With a recipe. Sometimes I have to remind myself to look at things from the proper angle. I had a cruddy morning. We realized just as I was leaving for work that the circuit that controls the poorly-wired disposal--the circuit that has been off since Saturday evening--also controls our deep freeze. I'm not even going to address the bizarreness of the wiring. Suffice to say it makes no sense. But I admit that I had a bit of a sobbing meltdown when I looked and saw pounds of thawed meat. I went ahead and went in and did what I needed to at work, and came home a couple of hours later to sort out what was still usable and what was destined for the garbage. I quickly found myself grateful that I had not had time to order meat from the farm this year. And that I hadn't spent hours picking blueberries in the hot sun, because the few that were in the freezer were ruined. I was grateful for the three bags of frozen sauerkraut; for some reason they stayed frozen and helped keep the meat around them cold. In the end we lost a lot of food. But we also were able to salvage a lot. Since I needed to go ahead and cook it I have the beginnings of several meals for next week and a big pot of chili for the weekend. I've been wanting to get my freezer and pantry organized and to simplify things a bit. I've wanted to get some meals or meal starters in the freezer. Done and done. I'm thankful that this happened after I have my new stove. I'm thankful that this happened on a cool day, when having the oven on all afternoon just makes the house smell good. I'm thankful that, although this is an annoyance and an inconvenience, losing this food in no way effects my ability to feed my family well. I'm thankful that, if the frozen wedding cake was going to thaw, it happened when the newlyweds are coming for the weekend. I'd been waiting for it. I kind of expected it before this. But the timing makes sense, when I think about it. For seven months my life has been completely focused on three things: selling our old house, getting our new house ready, and Bethany's wedding. We've been living in the new house for almost two months. Bethany has been married for a month. And Monday we turned over the keys of the old house to the relocation company. That was the last big deadline. After seven months of nearly constant time stress and nearly overwhelming financial decisions, we're done. Of course, we're not. The house is FAR from done. But there are no drop-dead, gotta-happens looming. And Tuesday I could hardly pull myself out of bed. I have absolutely zero energy. I'm making myself do what needs to be done--kind of--but there's so much more that needs to happen. And I have no desire to see to any of it. Oh, I've grocery shopped, and run my stupid car to two different garages in search of someone who can fix it, and gone to work, and driven kids places, and washed a few dishes. But I am living in the midst of chaos. I have piles of boxes, some semi-unpacked. My bedroom looks like a bomb went off. The bathrooms need cleaning. I have bills to pay and a couple of emails deserving responses. And I don't care. Or I do, but not enough to do any of it. I want to eat chocolate, play Sims, and cut and paste pieces of pretty paper. Or curl up in a ball in the corner. I know this will pass. The crash was almost inevitable. And I know what I *need* to do. I ate too many carbs yesterday--which tasted good, but left me feeling sloggy--so I made myself have a huge salad and tea for lunch today. I walked to work in the sunshine, and should probably go back out in it again for a while. I may let myself curl up in a ball at some point. After I go pick up my car and take Jonathan to his voice and piano lessons and fix supper.Or maybe after the weekend, since Bethany and Evan are coming and I really want to so some more cleaning. Or maybe I'll just keep going. But if you are wanting something from me: a phone call, email, letter, recipe, package, anything church-related, food, event, etc., have patience. Jane is currently out-of-order.